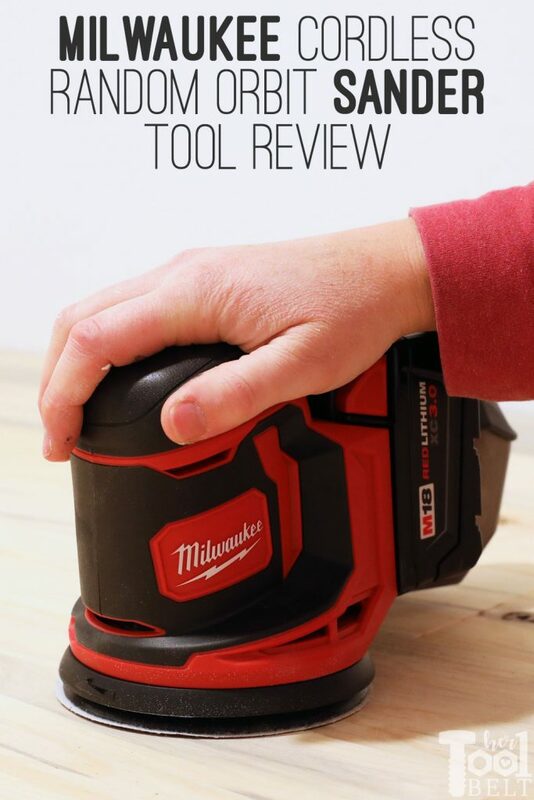 The Milwaukee Random Orbit Sander tool review is sponsored by The Home Depot. I have been compensated for my time and provided with product (tools). All ideas and opinions are my own. This post contains some affiliate links for your convenience. Click here to read my full disclosure policy. 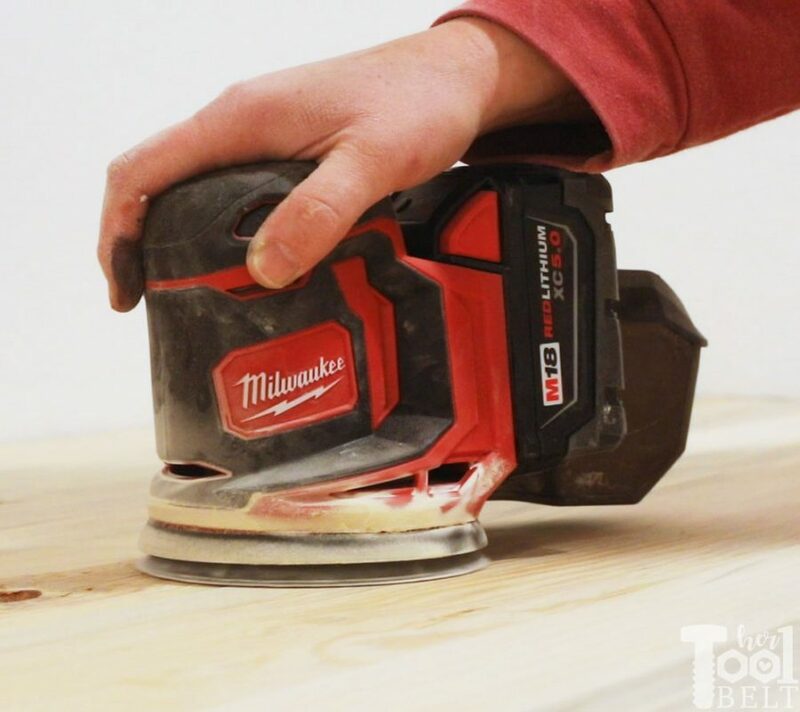 My first glance at the M18 cordless Random Orbit Sander was at a tool expo and I was drawn to the shape and the promise of smooth operation. I am excited to get my hands on one and take it for a spin. When I first tried battery operated sanders about 4 years, they weren’t my favorite. I would still go for the corded models for serious sanding. The battery operated ones would only be used when outlets were difficult to come by. However I have been super impressed by the progression in the last two years. I am quickly cutting the cords left and right. The shape of the sander top is a little different from other RO sanders I’ve used, but I found it really comfortable for my hand (my hands are on the large side for a woman). It’s a nice place to rest my hands while the sander is at work when sanding flat surfaces. Using the sander in applications where I was lifting and moving it a lot, the small palm grip made my hand a bit tired. The weight of this sander is about 4.3 lbs, so not too bad, especially when sanding flat surfaces. The on/off buttons and variable speed switches are in convenient locations near the top of the sander. Ok so the first thing you’ll notice if you use the dust bin/filter is that it sticks out far. I thought this would be a problem, and it may be in tight situations, but for the most part it really didn’t bother me during operation. But I can say that the dust collection in that bin was awesome, I really didn’t produce much sawdust in the air. 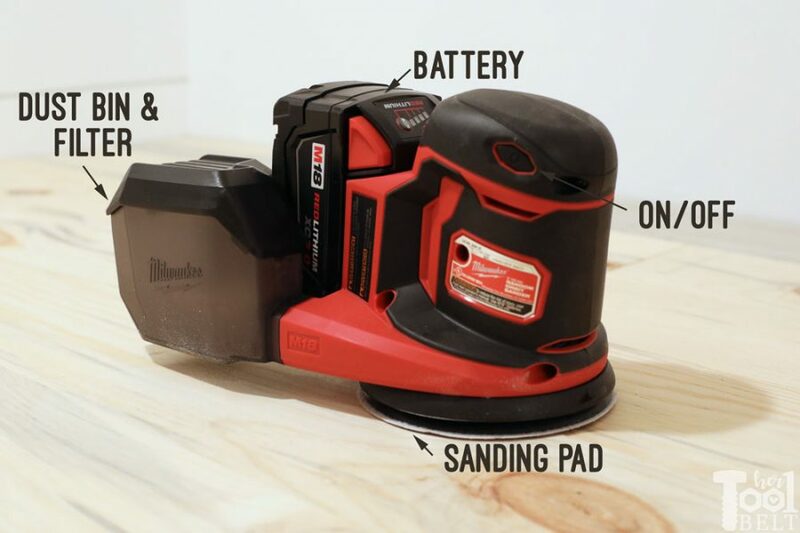 This sander is on par with the Bosch variable speed sander in that department. Emptying the bin was really simple too, just pop off the top, dump it and put the top back on. Another thing I was surprised about was how balanced the sander is with the battery and dust collection. I’ve used other battery sanders that tip over and can’t stand up on the sanding pad, no problem here. The Milwaukee sander ran surprisingly smooth, even compared to corded models. It’s probably the second smoothest operating sander I’ve used compared to the Bosch corded variable speed sander. Though the Bosch is smooth, I feel like it lacks aggression, and the Milwaukee has a good mix. 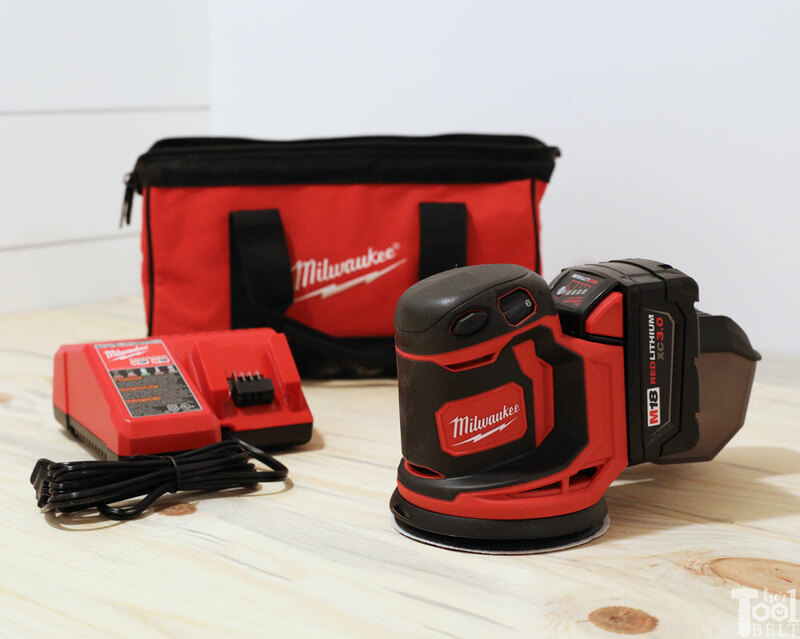 The run time for the Milwaukee 18V sander on a 3 ah battery is about 30 minutes depending on how aggressive you are. I would definitely have a spare battery or two charging while you’re working! 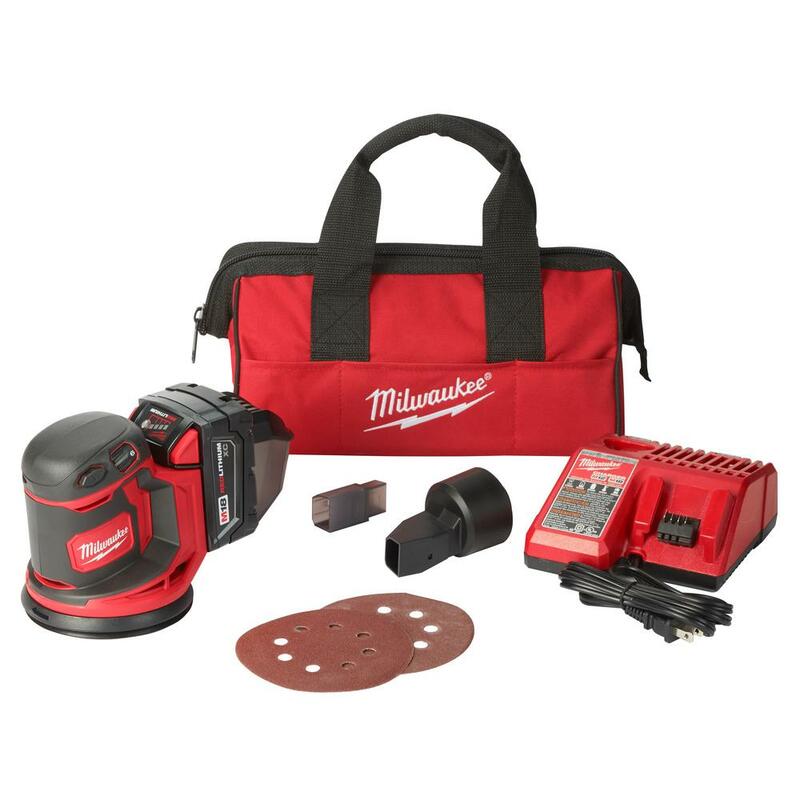 Overall I’m excited to have the 18V Cordless Milwaukee Random Orbit Sander in my tool box, we’ll be spending some quality time together! Thank you for this review! I currently have a Bosch sander. It’s fairly old and the dust bin is being held on by duct tape. I was just talking to my husband yesterday about getting a new one but decided that ours still works so why bother. But then this showed up in me feed. I think it may be a sign! Lol. I had the same problem with the Bosch and I limped it along or took off the bin and made a mess, 🙂 Eventually the little belt that keeps it from spinning out of control went out…so that was that.